serving you since 1951. Rated A+ by the Better Business Bureau An Award Winning Publication Read The Florida and Georgia Star Newspapers.thefloridastar.com Listen to IMPACT Radio Talk Show. The peoples choice The Florida Star P. O. Box 40629 Jacksonville, FL 32203 NORTHEAST FLORIDAS OLDEST, LARGEST, MOST READ AFRICAN AMERICAN OWNED NEWSPAPER Presorted Standard U.S. Postage Paid Jacksonville, FL Permit No. 3617 The Florida Star, The Georgia Star! (904) 766-8834Still The Peoples Choice! STRIVING TO MAKE A DIFFERENCE! 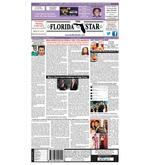 www.thefloridastar.com SEPTEMBER 21 SEPTEMBER 27, 2013 VOL. 63 NO. 23 STILL ONLY 50 CENTS Looking for customers to patronize your business or utilize your services? If you answered YES, then you need to place an ad in The Florida or Georgia Star! CALL 904/766-8834 to place your ad TODAY!! Check, Money Order, Or Credit CardsAccepted Wish to give us a News Story? Call (904) 766-8834 or Send it to: info@thefloridastar.com ad@thefloridastar.com Cant Get to the Store Have The Star Delivered Editorial...............................1 Church..........................2 Youth News...............................3 Talk of the Town...........................4 Columns..............................5 Crime and Justice........................6 Local-Florida................................7 Local-Georgia........................8 Sports........................9 Community.....................10 Classified...............11 Business........ ............................12 .... 12 I N S I D ESee Inside Church Talk of the Town Local Florida-Georgia Sports Community MISSINGCHILDREN SEE Crime & JusticeSEE WHATS INSIDE: See Page 9, Sports: Trayvons dad honored Jags updates Suns take home trophy Jacksonville Boxer Dead At 70 Mayor, Donor Issue Challenge to Help Teens His father Will Smith burst onto the hip-hop scene as the Fresh Prince with the hit Parents Just Dont Understand but it appears 15 yearold Jaden Smith didnt understand the consequences involved with encouraging his over 4,570,000 Twitter followers to drop out of school. The young star who teamed up with his dad on two flicks including stated If everybody in the world dropped out of school we would have a more intelligent society, Education is rebellion and School is the tool to brainwash youth. The Smiths alleged scientology school shut down recently. MAN ARRESTED IN FRIDAY THE 13TH MURDER Jacksonville cops continue search for Dollar General and bank robbers while six plead guilty in Brunswick By Frances Bradley, The Florida Star JACKSONVILLEThe Association for the Study of African American Life and History (ASALH, prounounced ah-sah-lah) will hold its 98thAnnual Conference in Jacksonville, Florida at the Hyatt Regency Jacksonville Riverwalk October 2-6, 2013. Organizers expect close to 1,000 to attend in spite of the call for a boycott of Florida and repeal of the state's Stand Your Ground law following the not guilty verdict in the George Zimmerman trial. For 98 years, ASALHs annual conference has drawn attendees from all over the U.S. and international destinations. The meeting features presentations of scholarly papers, panel discussions, and round tables about matters affecting African American life in the United States as defined by the annual Black History month theme. Conference plenary sessions are free and open to the public. African American heritage tours of Kingsley Plantation, American Beach, Jacksonville, and St. Augustine are also available for purchase by the public. Distinguished guest speakers include Director of the National African Art Museum and Jacksonville native Dr. Johnnetta B. Cole, daughter of Medgar Evers, Ms. Reena Evers, renown poet and author Sonia Sanchez, sister of slain 16th Street bombing little girl Denise McNair, Ms. Lisa McNair, Director of the Schomberg Center for Research in Black Culture Dr. Khalil Gibran Muhammad and many more. After George Zimmerman was acquitted of the shooting death of Trayvon Martin, ASALH members were among the voices in support of boycotting Florida. With barely three months before the opening session, the executive council met to discuss the pros and cons of moving the meeting to another state. ASALH's national president Daryl Michael Scott had these comments after the council voted to keep the meeting in Jacksonville. "For nearly a century, the Association for the Study of African American Life and History (ASALH) has sought to empower people through knowledge, and recent events make it necessary for us to rededicate ourselves to our founding purpose.... "As for ASALH, we will go to Florida in early October precisely because our local branches and members have asked us to come and bring knowledge to bear on the problems confronting their community and the nation. This is the right thing for us." Scott has announced the creation of an empowerment project to update election laws and state histories on efforts to disfranchise Black people, which will be presented in Jacksonville. For conference registration or exhibit information, visit http://online.asalh.org. Conference of African-American Historians and Scholars Will Convene in FloridaDuring an end-of-summer celebration for JaxParks Summer Night Lights (SNL) initiative on Wednesday evening, Mayor Alvin Brown recognized attorney Wayne Hogan of the Terrell Hogan Law Firm for his substantial financial commitment to the youth anticrime, anti-violence initiative that operates in select parks each summer. Brown then joined Hogan in issuing a challenge to others. We work very hard to invest in the next generation through quality programs, Mayor Brown said. We also are stronger when we work together. So it is my hope that Waynes commitment will serve as an inspiration to others in the community. As an agency partner in the SNL initiative, Sheriff John Rutherford also commended Hogans efforts. As a long standing partner in public safety, I would like to thank Wayne Hogan for stepping up and personally ensuring that this important crime prevention program occurred this past summer, Rutherford said. Because these SNL programs work, and because they have proven effective, I am sure more businesses and civic groups will support them, so we can help even more kids next year, Hogan said. As part of a larger $200,000 commitment made during Jacksonvilles 2012 Economic Summit, Hogan donated $35,000 to SNL 2013, allowing JaxParks to offer several new teenbased programs aimed at providing career experiences, team-building activities, dance and mentoring. Programs included School Beats Academy, an eight-week program that introduces youth to careers in the music industry; Unified, an eight-week mentoring program; Mayne Event, an eight-week program that teaches step dance and rhythm; SNLs sports activities geared to develop sports skills and emphasize teamwork; and Thursday Youth Education Nights, a diverse array of education classes based on the Learn2Earn model to help prepare youth for life after high school. Approximately 500 youth attended those programs. This is the fourth year for SNL. The initiative, geared towards youth ages 13 through 21, operates at select parks for eight weeks on Thursdays, Fridays and Saturdays from 7 p.m. to midnight. All activities are free. This years SNL hosted six locations: Clanzel T. Brown, Grand Park, Robert F. Kennedy, Emmett Reed, Woodland Acres and McGirts Creek. Additional sites hosting pool-only activities included Charles Clark, Harts Road, Jefferson St. and Eugene Butler. JaxParks staff counted approximately 17,000 visits to SNL sites during the summer. School is the tool to brainwash youth Jaden Smith Under Fire For Pushing School DropoutEX-FAMU PLAYER SHOT BY COP WHILE SEEKING HELP AFTER CAR CRASHThe Jacksonville born championship boxer, known for a his 12-round victory over Muhammad Ali, when he famously broke Ali's jaw, on March 31, 1973, has died. Kenneth Howard Norton, also known as the Jaw Breaker and Black Hercules passed away in Arizona on September 18 at age 70. While at Jacksonville High, he was a stellar athlete who won all eight events his track coach placed him in during a single meet. As a result, the Ken Norton Rule was passed limiting athletes to a maximum of three events. He later went to what is now Truman State University on a football scholarship. He won 42 of his 50 career fights, 33 of them being knock outs. Norton is a 1989 inductee of the World Boxing Hall of Fame, a 1992 inductee of the International Boxing Hall Of Fame, a 2004 inductee into the United States Marine Corps Sports Hall of Fame, and a 2008 inductee into the WBC Hall of Fame. He was awarded the Boxing Writers Association of America J. Niel trophy for "Fighter of the Year" in 1977. Voted Father of The Year in Los Angeles twice, Nortons son Ken Jr. was the NFL player to win a Super Bowl ring in three consecutive years. In tribute to his father's boxing career, Ken Norton Jr. would strike a boxing stance in the end zone each time he scored a defensive touchdown and throw a punching combination at the goalpost pad. Stars Say I Do In Weekend WeddingsIts official ladies John Legend and LeBron James are off the market. The superstars in music and basketball respectively walked down their aisle to their beautiful brides last weekend. Stevie Wonder was among the guests who attended Legends wedding to model Christy Teigan, who took to Instagram to share this photo. The couple have been an item since 2007. Meanwhile, James married his childhoo d sweetheart Savannah, who is mother of his children, in San Diego. While no wedding photos of Mr. and Mrs. James have surfaced, we did dig into the before they were stars vault to locate this high school photo next to this recen t pic of them at the ESP Y Awards. Katravis Forehand (pictured) has been arrested and transported to jail following his alleged involvement of the Friday September 13 shooting of Joe Nimmons. According to reports police responded to 5829 Christobel Avenue in reference to a person shot. Upon arrival the victim, Nimmons was located on the floor of the residence, unresponsive with multiple gunshot wounds following an argument while gambling with Forehand. He also allegedly shot another man, Andre Bell. Forehand was identified via photospreads by multiple witnesses. He is charged with murder and attempted murder. He was surrendered to the JSO invoked his right to remain silent. On Sunday, September 15, 2013, at 9:35 p.m., the JSO began investigating an armed robbery to the Dollar General Store at 9156 103rd St. According to reports, two suspects entered the store and demanded everyone get on the floor face down. A witness stated that the suspects further demanded money from the registers from the safe and pointed a handgun in her face. Another witness told claimed both suspects were carrying firearms and when they left the store they fled westbound on 103rd St. Investigators also have information that there may be a gray van with a black female driver involved in this incident. The first suspect is described as a black male wearing a red hat, a black long sleeve shirt, blue jeans and covered his face with a black bandana. The second suspect is described as a black male wearing a black and white hat, gray t-shirt, blue jeans and also covered his face with a black bandana. In a separate incident the following day at 12:01 p.m. JSO began investigating a robbery at the Synovus Bank on 961 S. Lane Ave. The suspect demanded cash but did not display a weapon. After the robbery the he fled on foot in an unknown direction. He is described as a black male, dressed as woman with a curly wig, large sunglasses and brown clothes. Anyone who has any information about these crimes is asked to contact JSO at 904-630-0500. BRUNSWICK GUILTY PLEAS. SEE PAGE 8 27 year-old North Carolina police officer Randall Kerrick (right) was charged with voluntary manslaughter on Saturday after police say he fatally shot a man who had apparently just survived a car crash in Charlotte and was looking for help. Kerrick was released on $50,000 bond. Jonathan Ferrell, a 24-year-old former Florida A&M University football player, was shot multiple times and pronounced dead at the scene early Saturday morning. Ferrell was unarmed. Ferrell family attorney Chris Chestnut said a video of the shooting recorded by a dash cam on one of the patrol cars shows that Kerrick fired four shots, then p aused. Moments later, the officer fired six more rounds and p aused again before firing the last two shots. "The shooting of Mr. Ferrell was excessive, the Charlotte-Mecklenburg Police Department said in a statement. Our investigation has shown that Officer Kerrick did not have a lawful right to discharge his weapon during this encounter. According to police, Ferrell crashed his vehicle into the woods, climbed out of his car and walked a half-mile to the nearest house. He began banging on the door viciously, Charlotte-Mecklenburg Chief Rodney Monroe said. said. Alcohol was not a factor in the car crash, cops noted. Ferrells family stated he moved to Charlotte about a year ago to be with his fiancee and was working two j obs. He wanted to go back to school and eventually become an automotive engineer. He had no criminal record. Dr. Kaye Smith. E kaabo (eh-kah-bow). Welcome. CONFERENCE NEWS October 2-6, 2013 Hyatt Hotel Jacksonville RiverwalkThe following events are FREE and open to the public: ASALH Exhibit Area Hyatt Regency Jacksonville Riverwalk 3rdfloor Elevator Landing & Orlando Room Thursday, October 3, 2013, 12:00 p.m.
6:30 p.m. Friday, October 4, 2013, 8:00 a.m.
6:30 p.m. Saturday, October 5, 2013, 8:00 a.m. 5:00 p.m. WEDNESDAY,October 2, 2013 Topic: Stand Your Ground: What Young People Are Doing and Can Do to Continue the Civil Rights Movement Special guest Sabrina Fulton, mother of Trayvon Martin 3:30 p.m., Milne Auditorium, Edward Waters College, 1658 Kings Road, 32209 THURSDAY, October 3, 2013 Plenary Session I Topic: African American Studies Past and Present: A Session in Appreciation of John H. Bracey 5:45 p.m.
7:45 p.m., Hyatt Regency Jacksonville Riverwalk Grand Ballroom 1 & 2 Authors Book Signing 7:45 p.m.
9:45 p.m., Hyatt Regency Jacksonville Riverwalk Grand Ballroom PreConvene Area FRIDAY, October 4, 2013 Plenary Session II Topic:  How Free is Free? : The March Since 1963 4:00 p.m. 6:00 p.m., Hyatt Regency Jacksonville Riverwalk Grand Ballroom 1 & 2 Poetry Slam 10:00 p.m.
12:30 a.m., Hyatt Regency Jacksonville Riverwalk Grand Ballroom 1 & 2 SATURDAY, October 5, 2013 Plenary Session III Topic: Making Emancipation: From a Black Reconstruction to a Black President 4:00 p.m.
D i g i t a l 1 7 2 C o m c a s t 2 2 5 M o v i e s S p o r t s C o n c e r t s P o s i t i v e F a m i l y E n t e r t a i n m e n t Love To Shop Here. Love To Save Here.For a list of current Buy One Get One Free deals, weekly specials, and coupons, visit publix.com/save. To view deals on your smartphone, scan the code. Love To Shop Here. Love To Save Here. Whether shopping for the week or for the items you need to prepare your favorite dish, with a little planning, you can take advantage of savings that are just as satisfying as the meal itself. There are deals throughout the store. Bring in your coupons and save even more. With all the ways Publix helps you stretch your grocery dollars, you can plan on leftovers of the green kind regularly. And we dont mean lettuce. Add a side of Saving sto every meal. Love To Shop Here. Love To Save Here. publix.com/save. Scoop up hugs, kisses and Savings. The Community of Sinai will celebrate "The Man, Pastor and Community Leader" Dr. John Davis Perry, II On Sunday, Sept 29, @ 6pm 7280 Dover Bluff Road, Waverly, Georgia. This Appreciation Service is being slated as an opportunity to encourage one of Gods Generals while being encouraged. Guest Speaker for this celebration is Elder Dwight Follins. Dr. Perry is the Senior Pastor of Mt. Sinai Missionary Baptist Church of Waverly Ga., a community of imperfect people, who welcome imperfect people to learn and grow in the truth of Gods inspired Word. Under Dr. Perrys guidance, Mt Sinai has experienced phenomenal growth becoming one church in two locations serving both the city of Brunswick, Georgia at 3150 Johnston Circle and Waverly, Georgia at 7280 Dover Bluff Road. Dr. Perrys vision has spearheaded several outreach programs, including S2S (Service to Seniors) in 2010, Sinai Success Academy-Summer Program in 2011, both community based programs that have empowered the City of Brunswick and the Surrounding Communities. Dr. Perrys social and community activity has been noted, garnering him the 2011 Links, Inc. "Man of Distinction" Award and a 2012 appointment as President of the Brunswick, GA Chapter NAACP. He serves as Bishop for PFHC (Pentecostal Fellowship of Holiness Churches). He is an inspirational author, a personal development trainer, motivational speaker, spiritual advisor & spiritual father to many. He holds a Doctorate as a Philosopher of Christian Education and a Masters in Christian Education from Jacksonville Theological Seminary. For Additional Information please contact (912) 265-8254. PAGE8 THESTAR SEPTEMBER21, 2013 DR. JOHNPERRYIII: The Man, Pastor and Community Leader FEDERAL PROSECUTIONS FOCUSING ON GUN, DRUG AND VIOLENT CRIME IN BRUNSWICK, GA AREA NET SIX GUILTY PLEASCortez Arbery, 25, of Brunswick, pled guilty earlier this month before Chief United States District Court Judge Lisa Godbey Wood to being a felon in possession of a firearm. If Arbery is determined to be an armed career criminal, he faces a minimum of 15 years in federal prison. During the guilty plea hearing, the evidence showed that Arbery possessed a stolen .38 caliber pistol after having been previously convicted of three felony drug offenses. Arberys guilty plea was the latest in a series of federal prosecutions focusing on gun, drug and violent crime in the Brunswick, Georgia area. Five others previously pled guilty in federal court for their role in weapons and drug offenses: Gromyko Green, 33, pled guilty to possessing a sawed-off shotgun and cocaine; John Wesley Boone, 27, pled guilty to being a felon in possession of a firearm; Calvin Grovener, 24, pled guilty to being a felon in possession of a firearm; Patrick Tenney, 23, pled guilty to receiving a firearms while under indictment; and, Reginald Beckham, 19, pled guilty to trafficking crack cocaine. The sentencings of each of the six defendants will take place after the United States Probation Office conducts pre-sentence investigations. United States Attorney Edward J. Tarver said, The number one priority of the United States Attorneys Office is the protection of the citizens of the Southern District. Those who commit violent offenses in the Brunswick area by trafficking in guns, drugs and the fear of others can expect to have their operations relocated to a federal prison cell. All six cases were investigated by the Glynn/Brunswick Violent Crime Task Force, which consists of agents and officers from the ATF, the FBI, the Glynn County Police Department, the Brunswick Police Department, the Glynn County Sheriffs Office, and the Georgia State Probation Office. The Task Force was formed in December 2012 to combat growing gun violence in Glynn County. Thus far, over 53 guns have been seized. Investigations are ongoing and further federal prosecutions are expected. Assistant U.S. Attorneys Charlie Bourne and Shane Mayes prosecuted the cases on behalf of the United States. Last week, Connie Patrick, Director of FLETC, presented a $500 check to Chief Tobe Green for the Brunswick Police Department K9 program. The money was collected by FLETC staff members. The Brunswick Police Department expressed thanks to them for their contribution to help restart their K9 program. FLETCDonation To Help Reestablish BDPK9 Unit JURY SELECTION BEGINS IN BRUNSWICK MASS MURDER CASENearly four years after what is considered Georgias largest mass killing in recent memory, it appears that the death penalty murder trial is finally getting underway to determine the fate of the accused, Guy Heinze Jr. Back in 2009, police responded to a gruesome scene at Good Hope Mobile Home Park after Heinze claimed his entire family had been beaten to death. The victims were Guy Heinze Sr., 45; his close friend Russell Rusty D. Toler Sr., 44; Tolers children, Russell Toler Jr., 20, Chrissy Toler, 22, and Michelle Toler, 15; Rusty Tolers sister Brenda Gail Falagan, 49; and Chrissy Tolers boyfriend, Joseph L. West Jr., 30 and Chrissy Tolers 3 year-old son Byron Jimerson. Michael was still alive when police arrived but succumbed to injuries a day later making Byron the sole survivor of the massacre. Now 7, the boy recovered from a severe head injury and has since resided with his paternal grandmother. Now the quest is on to select jurors in a case which made international headlines. 450 potential jurors were summonsed on Monday with only 256 appearing. It is hoped that the number can be narrowed to 50. If they fail to qualify after individual interviews, then another group of 450 potential jurors will be summonsed. Of the 256 who responded to their summonses, there are at least 15 panels of 14 to 16 potential jurors. The panels came to court at 9am and 2pm, respectively. They were advised on the trial procedures and advised that in the event they find the suspect guilty, three possible sentences can be delivered life with the possibility of parole, life without parole and death. Heinz trial is set to begin in October.